This revised and expanded edition contains up-to-date information about more than 3,500 holidays, festivals, celebrations, commemorations, holy days, feasts and fasts, and other observances from all parts of the world, including over 200 entries that are new to this edition. New features in this edition will include a World Calendar of Holidays with additional indexes arranged by date, genre, and geography and many important and useful features have been updated and expanded, including: glossary of terms related to time; explanation of calendar systems around the world; facts about the U.S. states and territories; U.S. presidents; legal holidays by state and by country; domestic and international tourism sources; bibliography; and the chronological, special subject, and general indexes. 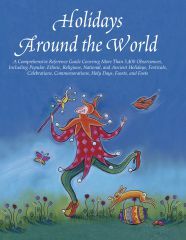 "Holidays Around The World is a comprehensive reference guide that covers more than 3,500 secular and religious observances. Enhanced with contact information, multiple appendices with background information on world holidays, an extensive bibliography, and multiple indexes, this book is especially and unreservedly recommended for both community and academic library reference collections."